Dr. DeWitt F. Eskew, physician and surgeon, and present representative in the Legislature from Butler County, was born in Wilson County, Tenn., in 1849, and is the son of W. and M. (Van Hooser) Eskew, natives of Wilson County, Tenn., and the grandson of Benjamin Eskew, a native of England, who, when a young man, together with his brother, set sail for America. The vessel was wrecked, the brother was lost, and Benjamin was for eleven days without food, and suffered all the horrors of being shipwrecked. 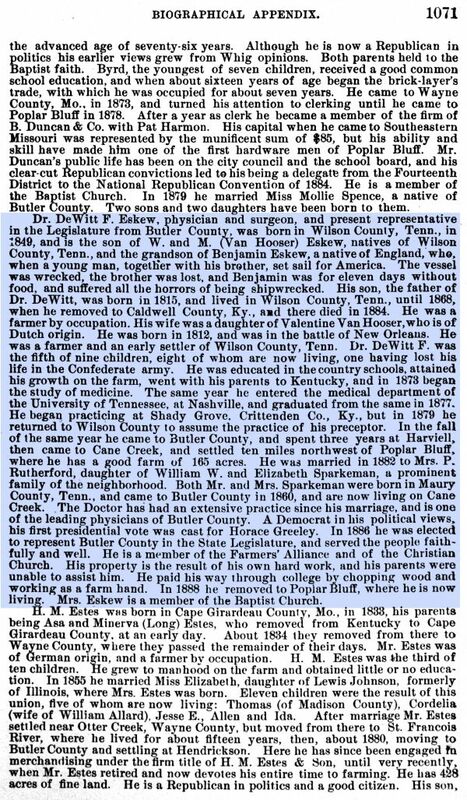 His son, the father of Dr. DeWitt, was born in 1815, and lived in Wilson County, Tenn., until 1868, when he removed to Caldwell County, Ky., and there died in 1884. He was a farmer by occupation. His wife was a daughter of Valentine Van Hooser, who is of Dutch origin. He was born in 1812 [sic], and was in the battle of New Orleans. He was a farmer and an early settler of Wilson County, Tenn. Dr. DeWitt F. was the fifth of nine children, eight of whom are now living, one having lost his life in the Confederate army. He was educated in the country schools, attained his growth on the farm, went with his parents to Kentucky, and in 1873 began the study of medicine. The same year he entered the medical department of the University of Tennessee, at Nashville, and graduated from the same in 1877. He began practicing at Shady Grove, Crittenden Co., Ky., but in 1879 he returned to Wilson County to assume the practice of his preceptor. In the fall of the same year he came to Butler County, and spent three years at Harviell, then came to Cane Creek, and settled ten miles northwest of Poplar Bluff, where he has a good farm of 165 acres. He was married in 1882 to Mrs. P. Rutherford, daughter of William W. and Elizabeth Sparkeman, a prominent family of the neighborhood. Both Mr. and Mrs. Sparkeman were born in Maury County, Tenn., and came to Butler County in 1860, and are now living on Cane Creek. The Doctor has had an extensive practice since his marriage, and is one of the leading physicians of Butler County. A Democrat in his political views, his first presidential vote was cast for Horace Greeley. In 1886 he was elected to represent Butler County in the State Legislature, and served the people faithfully and well. He is a member of the Farmers' Alliance and of the Christian Church. His property is the result of his own hard work, and his parents were unable to assist him. He paid his way through college by chopping wood and working as a farm hand. In 1888, he removed to Poplar Bluff, where he is now living. Mrs. Eskew is a member of the Baptist Church. Source: "History of Southeast Missouri", p. 1071, Goodspeed Publishing Co., Chicago, IL, 1888.